← BFZ: Is green really that bad? 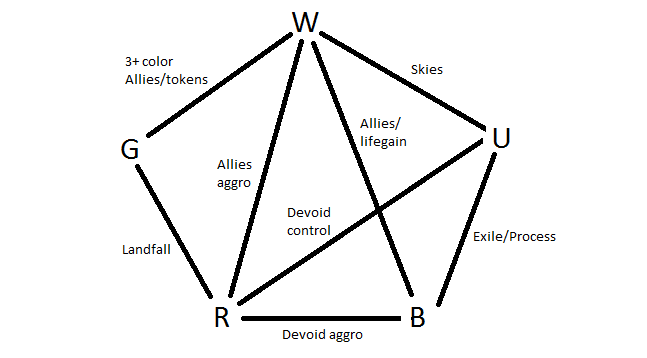 The diagram below is a visual representation of the mainstream archetypes in BFZ/BFZ/BFZ draft, i.e., archetypes which can reliably be drafted in a typical 8-person draft without relying on “build around me” uncommons. A line between 2 colors means there is an archetype in that color pair or an archetype in which those 2 colors are the primary colors. The line is labeled with the archetype name. Per previous analysis, there aren’t enough cards to reliably support B/G and G/U decks in a typical 8-person draft. Consequently, white and red are part of 4 different archetypes, blue and black are part of 3 different archetypes, and green is part of only 2 viable archetypes. Starting your draft with white or red cards offers the most flexibility since you can pick any other color as your second color, depending on what’s open. On the other hand, if you start with green, you have to hope that either white or red is also open. Green is widely considered the worst color in Battle for Zendikar. Combined with the lack of flexibility it offers, it doesn’t make sense to take green picks early, and the bar should be pretty high to choose it as your first color. In a recent draft, I took Vile Aggregate over Woodland Wanderer first pick, and Clutch of Currents over Oran-Rief Hydra second pick, and had no regrets (I went 4-1 with that deck). However, if I were already in red or white and saw those cards third or fourth pick, I’d be willing to move into green at that point. W/U skies and U/R devoid are often considered the strongest archetypes in the format, so there’re reasons to start with blue instead of white or red. The other reason to favor blue initially is that it has the 2 best commons in the set (Eldrazi Skyspawner and Clutch of Currents), as well as one of the best uncommons (Coastal Discovery). Of the 8 archetypes, 3 are Ally-based and 3 revolve around colorless creatures. This means that, until you know your second color, you should pick Allies and colorless creatures over similarly powered creatures that are not. (There are no colorless Allies.) Even if you end up in one of the 2 archetypes that don’t rely on those (W/U fliers or R/G landfall), it can still prove advantageous, e.g., using Coralhelm Guide to trigger Kor Bladewhirl’s rally effect.